Periodically, I do radio and other interviews. While radio interviews are not easy to reproduce on the internet, my recent interview with the president of The Villages Tea Party is a video with an easy to access link. 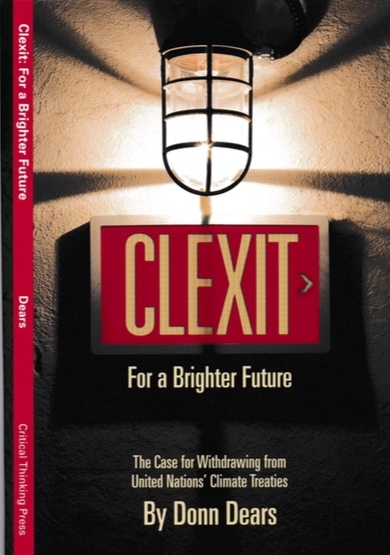 The purpose of the interview was to discuss my new book, Clexit For a Brighter Future, and why the United States should withdraw from the UNFCCC treaty. Most Americans don’t realize that the Senate ratified this treaty in 1992, and that it obligates the United States to participate in reducing CO2 emissions. On Saturday, March 11, the Wall Street Journal said the United States should withdraw from the UNFCCC treaty. Clexit explains why it’s the right thing to do. Click on the start > button to start the video. Don’t link to Amazon, silly. They are the antithesis of your energy policy position. Unfortunately, Amazon is one of the only means for small presses to get their books to market. Barnes & Noble is impossible to work with.